Kenyon, W.A.. "Rainy River Burial Mounds". The Canadian Encyclopedia, 04 March 2015, Historica Canada. 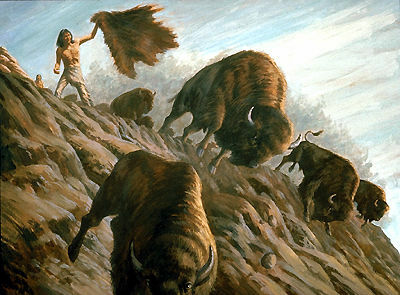 https://www.thecanadianencyclopedia.ca/en/article/rainy-river-burial-mounds. Accessed 24 April 2019. 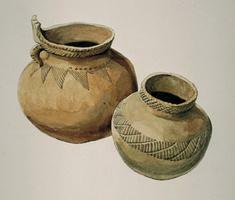 Clay pots were used by the Eastern Woodlands people. In burial grounds, they were used to hold food for the departing spirits (artwork by Gordon J. Miller). The Rainy River Burial Mounds archaeological sites are located on the Canadian bank of the Rainy River in Ontario. They were built by the Laurel and Blackduck peoples between the early Christian era and the early historic period. Most of them are low and broad structures, although one at the Long Sault Rapids is 34 m in diameter and 7 m high. Both within the mounds and in pits below are clusters of human bones and, occasionally, rich assortments of grave furniture. Clay pots filled with food for the departing spirits were placed in the grave; shell, bone and copper beads were scattered across the graves; and the whole was then sprinkled with red ochre. 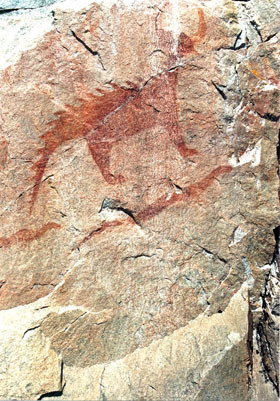 In the historic period, although articles of European manufacture replace many native artifacts, the burial pattern remained ancient and aboriginal.